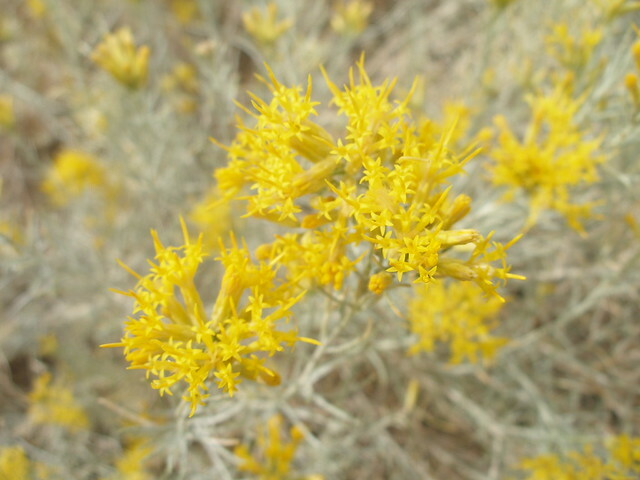 Gray rabbitbrush is very common in the Sage Hills. It rivals sagebrush in its wide distribution, but has a more limited range, requiring somewhat moister conditions and sandier soils. It is a deciduous shrub, with long narrow leaves and a height of two to four feet. White or gray woolly hairs densely cover the stems and leaves, and its foliage resembles the gray-green color of sagebrush. Rabbitbrush becomes very conspicuous when it blooms in late summer in a showy display of bright-yellow clusters of flowers. The rabbitbrush fruits are capped with many bristles that help the seeds spread in the wind. Rabbits do not prefer eating rabbitbrush, so the name may refer to their use of rabbitbrush for cover. Deer, antelope, and other range animals feed sparingly on the leaves, flowers, and young twigs.